I swapped my fat tyres for 35c’s and lightened up my gearing a touch and raised my saddle in preparation for the Red Bull Minidrome. I was super excited about this race, as it’s one of the most fun events to take part in. On Saturday, I qualified about 20th out of about 150 entrants, so was pretty pleased. On Sunday there was a second round of qualifications, where the top 50 had another go to qualify for the top 32 and the head to head heats. I went SO much faster than I went on Saturday and it was looking like I was gonna come in around 10th, based on my lap times, but on the eight lap, disaster struck and I came off my bike. I was absolutely gutted! 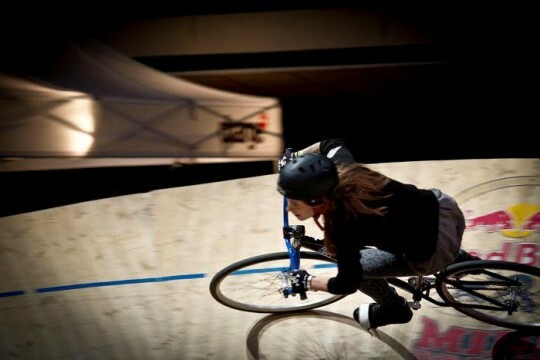 Minidrome is so much fun and that was the end of it. Can’t wait till next time! I’m not sure who took this pic… maybe James Hoppe? Hope you don’t mind me posting it! Red Bull posted some info on some of the riders and our set ups. Have a peek here.